This page explores the various type of water sensor for the detecting of water leakage. These sensors are commonly used to detect water leakage from aircon condensation. Aircon condensation water leakage is a very common sight in the industry. This problem is normally due to improper design and installation of the water drainage pipes. Water drainage pipes installed were too small resulting in water clogged by dust or mould when used over time. Some water drainage pipe was seen to be installed in a anti-gravity manner, which makes it impossible for any water to drain out. ->> Click here to learn more other problem relating to aircon water leakage. It is important to ensure how these pipes are deployed during the installation process so that you will not be faced with water leakage issues. If you are already facing the problem, consider reconstructing your water drainage system or implement the following sensor to reduce your trouble. AquaBlock or Aqua switch is installed in water tray for detecting of water leak from aircon or pipes. It can also be mounted at a specific height in the tank to detect water level. The aqua switch is only a block and does not have any moving parts. 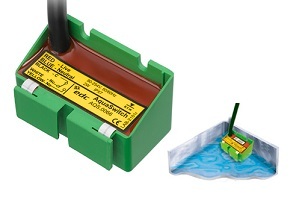 The sensor is a simple relay switch which will activate when water touches the sensor block. This sensor looks like a yellow cable or rope. This sensor cable is typically laid on the floor or above the ceiling to detect water leakage. 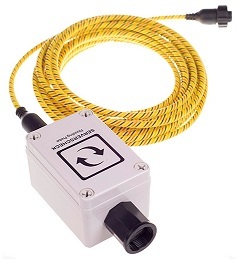 Any water touching this water sensor can be detected by the connected electronic sensor box. The cable can be place where water leakage is likely to befound. This type of sensor cable is commonly deployed in computer server room where there are many aircon system installed. Aircon leak is a common problem in a server room. Check out our other pages for more water sensing technology.